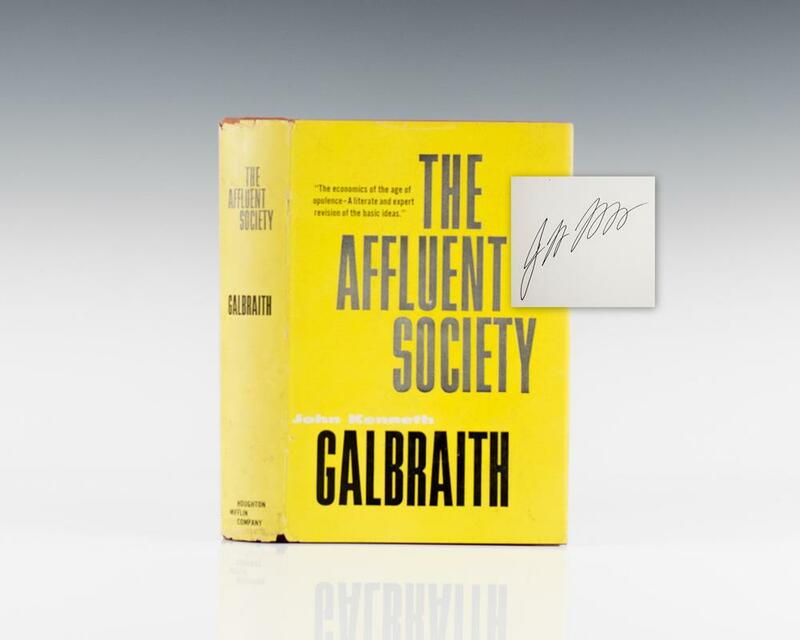 John Kenneth Galbraith's breakthrough as a best-selling author came with "The Affluent Society" for which he was honored with the American Economic Association's prestigious presidency. The book also influenced both the Great Society program and the rise of the American "counterculture" in the 1960's. Listed on Modern Library's 100 great nonfiction books of the twentieth century. Galbraith's ideas often addressed the influence of the potential market power of large corporations (Dunn and Pressman, 2005). He believed that corporations could become price makers, rather than price takers, by weakening the accepted principle of consumer sovereignty (Galbraith, 1970). This, in turn, allowed corporations to efficiently increase the production of their goods. First edition of Galbraith’s autobiography of his time as Ambassador to India. Octavo, original cloth. From the library of economist Peter L. Bernstein with his signature. Also, signed by the author John Kenneth Galbraith. In near fine condition.